From past to present, flowers continuously find purpose in our lives and imaginations. Besides serving to brighten gardens, flowers fill the air with rich and subtle fragrances. They are used as tokens of affection for those among the living and dead. They remain a constant source of artistic inspiration, as seen in the Indo-Islamic artwork of medieval India and the Impressionists paintings of modernizing Europe. They are used to identify political allegiances and are often employed as powerful symbols of human achievement as well as human folly. From being an essential ingredient of herbal teas to a customary offerings to Hindu Deities, flowers remained a mainstay in the lives of numerous people from around the world. Why do these shapely but fragile angiosperms appeal to us so much? For Babur, the first Mughal Emperor, the flowers of his royal gardens provided a comforting reminder of Farghana, his beloved but forever unreachable homeland. For poets like William Shakespeare and John McCrae, flowers have been the topic of imaginative imagery and the substance of metaphoric language. While Shakespeare often used flowers to represent human emotions in his plays and sonnets, McCrae described poppies growing on Flanders fields as being torches held by dead soldiers in his powerful poem, In Flanders Field. For Buddhists and Hindus mystics alike, the lotus personifies the successful realization of spiritual enlightenment, with the roots of the flower entangled in muddy water but the blossom rising above the surface in all its captivating glory. Obvious, people from all walks of life enjoy flowers for a variety of reasons. Although I appreciate many of these reasons, I nonetheless find that the Japan-based Buddhist perception of the cherry blossom, or Sakura, to be among the most relevant and instructive. That might seem like a fairly bold claim, but I cannot think of any flower that can better teach a human being how to think and live in our fast-paced-post-modern world. Up until the last two years, I did not pay much attention to cherry blossoms. It was during a spring visit to Yangmingshan, an active volcano near Taipei, that I first encounter these breath-taking tree flowers. Watching their pink, white, and violet pedals constantly fluttering to the ground, it struck me how sadly and beautifully these marvelous cherry blossoms seemed to come and go. Being surrounded by these falling pedals, I could not help feeling that they had more to offer than aesthetic value. However, by the end of spring, the illusive and mysterious Sakura became lost from sight and mind. It was during my second encounter with cherry blossoms in Vancouver that my interest became rekindled. 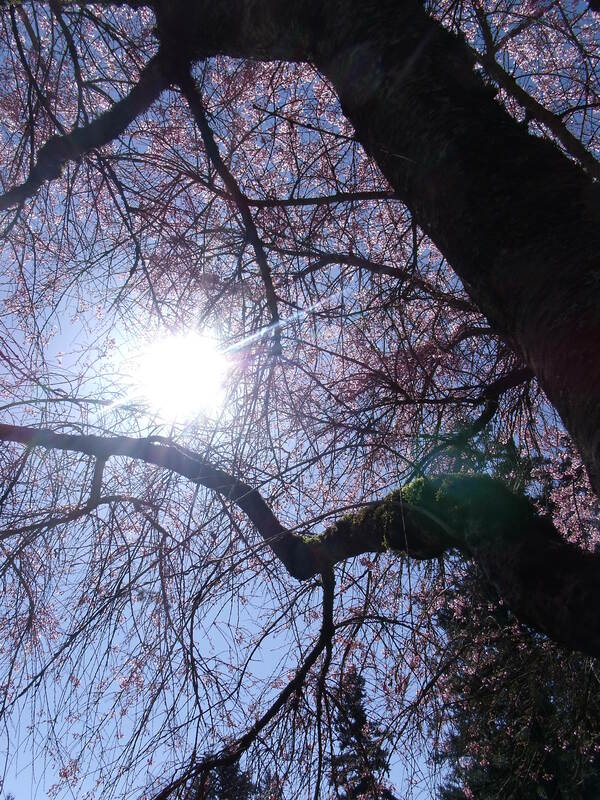 Watching how the cherry blossoms rapidly budded at the beginning of spring and gradually vanished by the end of spring, I came to better appreciate the transient but cyclical nature of the Sakura season. While visiting Vanduesen Botanical Gardens, I had the opportunity to see cherry blossom trees in full bloom side by side with pine trees, an interesting eco-cultural experience of West meeting East, fleeting pink mingling with forever green, flower pedal next to pine cone. It was like simultaneously walking in two worlds with one foot in the Asian Pacific Rim and another in the Canadian North. Now I admit, this observation certainly says a lot about myself; after all, walking in two worlds is not exactly new stuff for a second generation Indo-Canadian. Perhaps I could even be accused of choosing to see something of myself in the Vanduesen blossom trees. Nonetheless, I prefer to think, like the cultural ecologist David Abram, that human beings tend to discover a lot about themselves in what is not human. The imagery of sakura is problematic. It has long been entwine with the notions of birth and death, beauty and violence. Cherry blossoms are central to the Japanese worship of nature… and yet the sword guards of samurai warriors bore the imprints of sakura as a a last, wry reminder of the fleetingness of life… The starkest image of sakura is that of the Ishiwari-Zakura, the stone-splitting Cherry Tree… [that] took root and grew in a small crack in a very large boulder… [eventually] splitting the vast boulder in two like life out of stone-grey death. The power of beauty to shatter stone; as brutal and sublime as any sword. Although I already learned much about the Japanese notion of Sakura before reading Ferguson’s passage, his personal observation of its paradoxical meanings did much to broaden and deepen my own awareness of the dynamic nature of these flower trees in a Shinto-Buddhist cosmology. While initially viewing the Sakura season as nature’s way of subtly teaching by gentle example about the “fleetingness of life,” my understanding of the cherry blossom tree gained new dimension as I recognized how it simultaneously teaches us how powerful, stubborn, and destructive the will to live can be. The Sakura season always comes to an end but always with the promise that it will begin anew next year. Problematic imagery indeed. In a day and age where universal truths are becoming harder to maintain, and what we think we know becomes more easily debatable, perhaps the cherry blossom has something to teach us. In constantly reminding us that things that are seemingly contradictory can co-exist, it visibly demonstrates a way of thinking that is organic, pragmatic, and grounded in a world we all live in. In celebrating the cycle of birth and death on a yearly basis, it also models a natural way of being that balances an optimism for a colourful life with an acceptance of an unavoidable death. These are just a few of the revelations to be found in the beauty and sadness of Sakura. Are We Any Closer to a Prejudice-Free World?